Los Angeles experienced a rather large black out yesterday. The power outage got me thinking about how helpful a PDA would be during a blackout. If you were in Los Angeles during the blackout with your PDA you would have access to a host of data. Phone numbers to call and let everyone know about the black out or numbers for your spouse’s work to make sure all is well. You could still work on documents while your computer is down. You could listen to music while waiting for the bus that will be very late, especially with traffic signals not working. You could become a photojournalist and take pictures with your Treo 600 or 650 and email them to the news agencies or your blog. You could catch up on that book you downloaded last week or listen to Palm Addicts latest Podcast. You could review emergency procedures you downloaded to your PDA. You could review the list of emergency supplies you inventoried and added to your PDA. You could keep a journal on how to be better prepared for the next time this happens. You could play games to relax. All in all, the power might be down, but with your PDA you are still up and running (at least until the battery dies). I started to think about the Palm and how much it has changed my life. For 13 years I created educational software, six years at The Learning Company then seven years at Edmark which was purchased by an Irish company named Riverdeep. Working for Riverdeep was a challenge because of all the time zones involved and the amount of coordination required between offices, especially meetings. It became clear that all the senior staff was having difficulty keeping up with constant meeting changes from the Dublin, Ireland and Boston, Mass. offices. I would awake in the morning to find a dozen meeting invites in Outlook. Half of them would be rescheduling or change of location or a new dial in number. It was considerable work just opening the invite reading it agreeing to it, writing down the meeting location and topic, then opening the next invite, etc. There had to be a better way and there was. I came across a half dozen Palm Vs in the IT department, turned in by the sales staff. I borrowed one and started to experiment with it. I research its ability to synchronize with Outlook when an idea hit me. I hooked the Palm up to my PC and the next morning I quickly opened each meeting invite and agreed to the change. 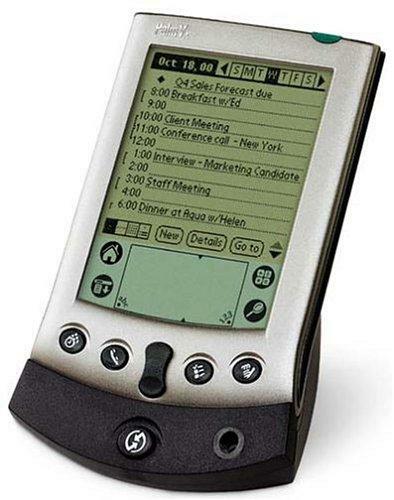 When finished I synchronized the Palm, and behold, all the meetings I needed to attend were on the Palm. This was huge. I just saved at least 15 to 20 minutes of reading and rescheduling. I got into the habit of returning to my desk between meetings and syncing my Palm, then going where the Palm told me to go. It was only a matter of days before I learned how to adjust the notes settings so now the meeting agenda was showing up on the Palm too. Then later I figured out how to add the contact list. I would now show up in meetings with the agenda. If someone wasn’t there and we needed to call them, I had their number. I was hooked on the Palm. Several weeks later I presented to management on the Palm and the other five Palm V’s were quickly appropriated. In 2002 Edmark was closed, all 250 plus employees let go. I was asked to stay for another four months, which I did. With that chapter over I started to think about the future; what to do with myself. When thinking about my future and what I was passionate about, the Palm rose to the top of the list. I started Smart Box Design in February of 2003 and I have been making PDA software ever since. Why do games have bugs? Or for that matter, why does any software have bugs? I remember when I first started working in QA and I was in a training session the teacher said, building software is unique. You can build a brick wall, take out a brick and the wall will stand. With software you leave out a line of code, put a comma in a wrong spot, or misspell a word, and you get a bug. This is why we test. Word Watch was released after the longest and largest testing effort to date. Despite its small appearance on a PDA it is very sophisticated and complicated code. Yet all the thorough testing that was done, a bug made its presence known. In Word Watch after you finish a game you can tap anywhere to go on. Or so we thought. In some situations if you tap on the graffiti area and you have reached a level that will put you on the High Score screen the game will freeze, on the High Score screen. But didn’t we test for that? We sure did, several times. But not all Palms are equal. In fact the code we used was in all our games and has never presented a problem. But combined with a recent device and a newer Palm OS the game hangs. It took some time to figure out the exact combination, but once found it was fixed and verified. The fix resulted in a new build of Word Watch which can be downloaded off our web site. Have you ever run across a bug in a game? Post a comment about it.